Isn't this review a bit late? Shouldn't we have been reviewing mummies during October? Larry Trainor's career as a test pilot ended tragically when he flew through a radiation field. The accident caused his body to emit deadly radiation that can only be contained by shielded bandages as well as the ability to release from his body a negatively charged phantom. Trainor became a founding member of the Doom Patrol with other heroes who gained their powers from tragic accidents. If Doom Patrol is a rip-off of the Fantastic Four, then Negative Man is its Human Torch. He's the heat/energy guy. No, he doesn't turn into a living pillar or flame, but a radioactive human silhouette is pretty much the same thing, isn't it? Hell, he even got his powers the same way the FF did! At least everybody else managed to swing their own origins; all he gets is second place. Negative Man uses the smaller male body, but there are so many unique sculpts in DCU13 that we're not really upset about seeing it here. It was never the re-use of bodies that we objected to, it was the over-use of them. The Doom Patrol uniforms are simple, so this body is suitable. He has raised boots and a separate belt with a D logo buckle. His fists are new, since they needed to be wrapped in bandages - Wildcat's were similar, but not wrapped sufficiently to reuse. His neck and head are bandaged, as well. Actually, it's his whole body, but that's all that's exposed from the costume. I suppose we could get really picky and say that since he has bandages under his costume the body shouldn't be as smooth as it is, but forget that! It's not like artists ever drew him lumpy back in the day, so think of the suspension of disbelief as the toll you have to pay. Negative Man is the second figure in Series 13 to get a variant. His is an attempt to suggest his powers - no, it's not a translucent black body (though that really would have been ideal), but it does come close. The variant is slightly unmasked: the bandages have been pulled away from his face, so you can see his face and a bit of hair. This part actually is translucent black, so "yay!" The story goes that the radiation turned Larry's skin and muscles transparent, so beneath his bandages all he'd be is bone, but think of this as the energy being just being released or absorbed. Since it's only the face, not the entire head, that's molded from clear plastic, it's a separate piece glued in place. As an Easter egg, if you carefully pry the "mask" off, you'll find a fully sculpted, fully painted skull. Technically he should still have eyes in the sockets, but at this point, we're not going to hold that against the figure. This really is a feature that Mattel should have played up: I was perfectly happy ignoring the variant Negative Man when it seemed the face was the only difference; when I found out about the skull beneath, I picked it up the next day. All the DC figures Mattel released in 2010 (save the Justice League Unlimited toys) include a DC 75th Anniversary collector button, featuring art from (often unrelated) DC comics. Negative Man's pin shows Batman from the cover of Brave and the Bold #59, for no clear reason. Negative Man has a cool visual, guys; why not use him? 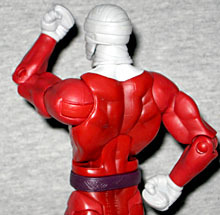 He also includes two pieces of this series' BAF, Trigon. He gets the right arm, and a 9" tall staff with a dragon at the top and its tail wrapped halfway down. It's a piece straight from the comics, and as usual, everything looks fine. The arm moves at the wrist, elbow, bicep and shoulder. Negative Man is the second member of the Doom Patrol - or the third, if you count Beast Boy. He's got a decent design, and a cool execution. Even the seemingly unnecessary variant figure is worth getting. Now, how long until we see Mento, Elasti-Girl and the Chief?